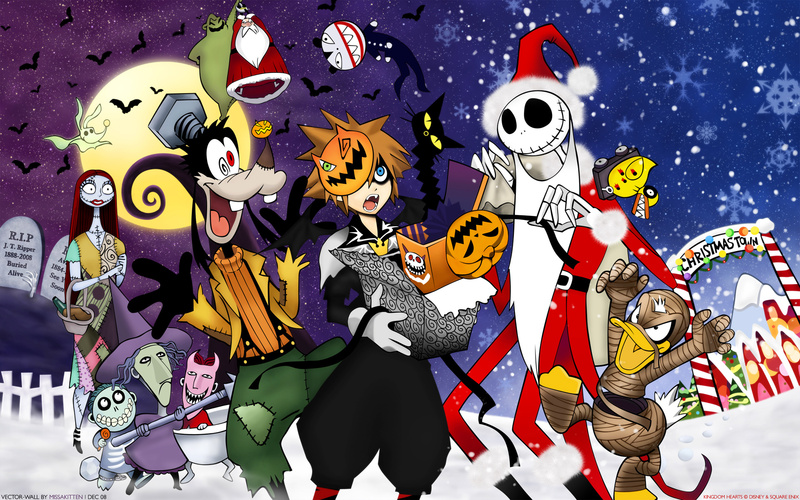 Kingdom Hearts Wallpaper: Welcome To Christmas Town! Minitokyo »	Kingdom Hearts Wallpapers » Kingdom Hearts Wallpaper: Welcome To Christmas Town! Might be a bit late as far as the date but well the scan wasn't available until recently. Here is my recent wallpaper of Kingdom Hearts, It's posted on AP but I wanted to share it here too ^__^. So merry Xmas to those of you who celebrate and happy holidays to everyone else! More resolutions and detailed description can be found @ AP. A great wallpaper for christmas! U did a good job! It's awesome! I hope it gets into elite gallery! ^-^ Or at least popular submissions! I'm seriously in love with this; the detail is amazing. The coloring is also very vibrant, it makes the wallpaper look so alive!~ Thank you for sharing this MissaKitten, it's amazing. Hmm...though i can not see that here,but i know that is beautiful wallpaper,i like already this scan,but this is total awesome!This vector is perfect,fantastic funny,i have it now on my desktop!Well done! thanks for sharing ! LOVE the wallpaper. Looks awesome. Thanks for sharing! Nice wallpaper! It's a great one for Xmas and Halloween! <<<<>YAY! kingdom hearts scan rules! nice scan. GREAT PIC ^_^.